Few individuals had a greater impact in shaping the housing needs of early 20th century Seattle than builder and financier Gardner J Gwinn. 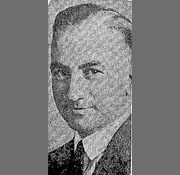 Reportedly his company built more than 600 homes, apartment buildings and commercial projects in and around Seattle during the construction boom of the teens, twenties and thirties. Gardner J. Gwinn was born in Nova Scotia, Canada on July 29, 1888. There he began working construction with his father at an early age. At the age of 21, in 1909 he moved to Seattle; most likely at the urging of his older brother Wells. At the time, the Alaska-Yukon-Pacific Exhibition was underway and the city was booming. Housing was in great demand, and local contractors had just launched the Master Builders Association to bring some order and disciple to the industry. Seattle offered ample opportunity for immigrants as talented and ambitious as the Gwinn family. Gwinn’s family tree had been rooted with builders for several generations back, and he and his siblings were destined to continue in the family business. His brother, Wells, would create a competing construction business, and his other brother, George W., became a prominent painter in Seattle. Eventually, Gardner's sons George B. and G. Weldon carried on the family tradition and became builders as well. With experience at hand, in 1913 Gardner started his own construction firm, Gardner J. Gwinn, Incorporated. He began as a hands-on builder, and in the early days he listed his occupation as both a plumber and painter. But a talent for business emerged early, and he was soon putting up houses in such profusion that he had to leave the labor to others and he concentrated on his rapidly growing enterprise. Reportedly by 1924, he employed more than 150 people and his company became the largest homebuilding business in the Northwest. His one-stop shop business model, which offered homebuyers everything from labor and material, to building plans and financing, was very enticing to the middle class home buyer. Prices of his homes ranged from $5,000 to $25,000. Gwinn’s houses were known for their livability and sturdy construction. He focused on single-family homes, and for several years published popular plan books titled with the company motto “Homes of Individuality.” As his success increased, he started to purchase large tracts of land, and his company designed, built and financed all the homes on them. His projects included the development of the Cowen Park (44 homes); Ravenna Park; University Place Addition (60 homes) Ridgemont Addition; Gwinn Addition; North Broadway (35 homes) and Bothell Way areas. Always an innovator, Gwinn was tapped by Seattle’s Electric Club in 1922 and 1923 to design and build the city’s first all-electric demonstration homes, which were used to educate the public on the many labor-saving advantages of electrical appliances. He also designed and built the 1925 Seattle Post Intelligencer “Home Beautiful House” and the "Arquetite" model home (1926) both in Lake City. While Gwinn was not a licensed architect, he did advertise his firm’s architectural services. He most likely used his in-house staff to create his plan books and research indicates that during the early 1920s architect, Cyril A. Costello served as Gwinn’s in-house architect and designer. Gwinn also used outside architects to create designs for him such as the Ridgemont project which he hired the architectural firm of Smith, Carroll & Johanson. By 1925 Gwinn began to turn his attention to the development of apartment and hotel buildings, reportedly putting up more than 50 of them before 1930. Notable projects include the Marlborough House (1927); Astor Court Apartments (1926); Glen Eden Apartments (1929); Garden Court Apartments (1929); and the Benjamin Franklin Hotel (1929). Gwinn was a longtime member of the Chamber of Commerce and the Exchange Club and he devoted many hours to community service. In 1924, Gwinn joined fellow builders Stanley Long and Edward L. Merritt in a successful effort to re-establish the Seattle Master Builders Association to represent the interests of area home builders after the original organization folded. Founded in 1909, the association had been absorbed by the Associated General Contractors. Merritt, Long, and Gardner served successively as presidents of the new organization, Gardner in 1927–1928. Eventually pulling back from active engagement in the construction business, he became occupied with private investments. Gwinn retired after he and his wife, Vera, were involved in a head-on car collision near Tacoma in 1949. Vera did not survive the accident. Gardner lived for another ten years but passed away unexpectedly while bowling at Seattle’s University Lanes on October 30, 1959 at the age of 71. “Gardner Gwinn’s Wife, Hurt in Collision, Dies” – Seattle Times: July 14, 1949. “Death Takes Gardner J. Gwinn” – Seattle Times: October 31, 1959. “Injured Seattle Couple Home after 2 Months” – Seattle Times: April 17, 1949. “2 in Critical Condition, One Dead in Crash” – Seattle Times: February 19, 1949. Jones, L. Beth Yockey. One hundred years of building community: Master Builders Association of King and Snohomish County. Seattle, Wash. Abecedary Press, c2009. “Modern Electrical Appliances Demonstrated” – Seattle Times: Aug 5, 1923. “Model Electric Homes” – Seattle Times: Sept 24, 1922. “Crowds Visit Model Homes Now on Display” – Seattle Times: June 6, 1926. “Gwinn Home Building Company Offers Bonds” – Seattle Times: December 12, 1924. “Washington” – Domestic Engineering: May 27, 1922. Domestic Engineering – June 21, 1919. “Take Your Pick At Ridgemount: Types Vary” – Seattle Times: May 30, 1937. Advertisement: “Gardner J. Gwinn, Inc.” – Seattle Times: March 12, 1923. Advertisement: “Gardner J. Gwinn, Inc.” – Seattle Times: March 20, 1930.